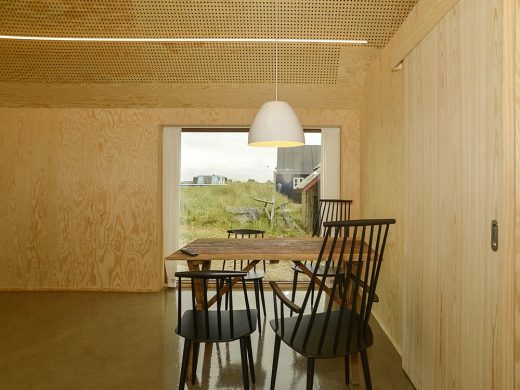 Danish Architectural firm Cubo has recently completed an artist’s residence that will function as an open-door workshop and exhibition space, whilst offering free accommodation to artists for a week or two at a time. 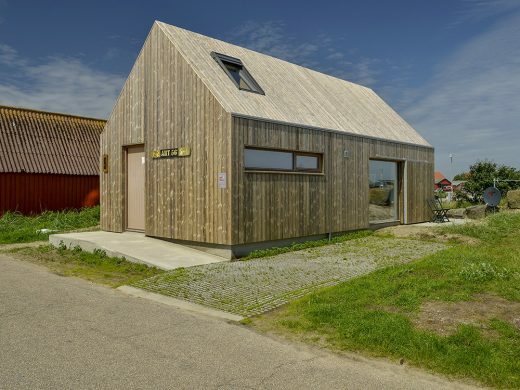 Clad in sustainable Kebony wood, this unique ‘Artist’s House’ overlooks the picturesque port of Tyskerhavn in the Danish town of Hvide Sande. 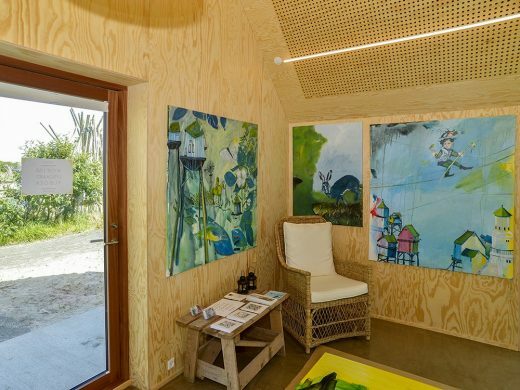 The house, owned and run by the local tourist board, Holmsland Klit Turistforening, has already proved to be a huge success with both artists and the local community, with bookings for every week until December. Guests of the house live and work in the idyllic retreat for free between Easter and late October and are asked in exchange to open the doors to visitors from 12pm to 4pm Sunday to Thursday. 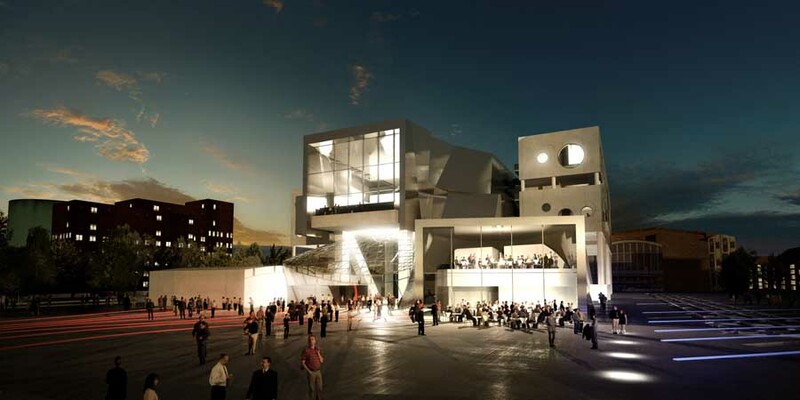 This enables visitors to follow the development of an artist during the creation of their work. Many artists are often unwilling to unveil their work to such a high level of observation; for those that have the courage to do so, it is a wonderful and unique opportunity to encourage interaction between art enthusiasts. To ensure visitors get the most out of their trip, a small group has been set-up to review the work of artists that apply to stay in the house and decide who should be selected as an ‘artist in residence’ over the year. 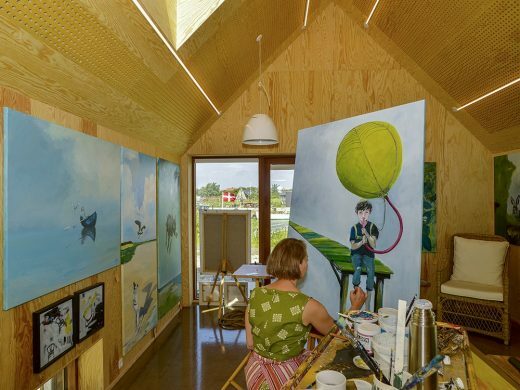 This helps to maintain a consistently high quality to the paintings and sketches displayed. 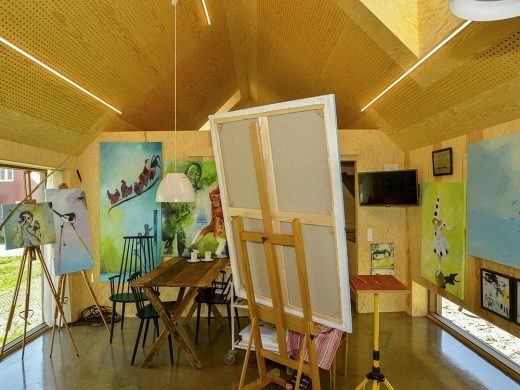 Not only must the work be of a certain standard, but also a high level of versatility is preferable, enabling visitors to the ‘Artist’s House’ the opportunity to see a variety of styles and compositions. The property has been carefully designed to maximise the space inside the house, with a bedroom, bathroom, living room and kitchen all fitting into just 50 square meters. The exterior of the house, both walls and roof, are built using environmentally friendly Kebony wood. In addition to its sustainable credentials Kebony was chosen for the cladding due to the wood’s aesthetic qualities, allowing the house to subtly blend into its surroundings, evoking a sense of nature in its outward appearance. As the Kebony wood weathers over time it will adopt a delicate silver-grey patina, reminiscent of driftwood, which will further allow it to assimilate into the beautiful Danish countryside. The patented Kebony technology is an environmentally friendly process, which modifies sustainably sourced softwoods by heating the wood with furfuryl alcohol – an agricultural by-product. By polymerising the wood’s cell wall, the softwoods permanently take on the attributes of tropical hardwood including high durability, hardness and dimensional stability, without the need for tropical deforestation, resulting in a high performing, beautiful wood product.